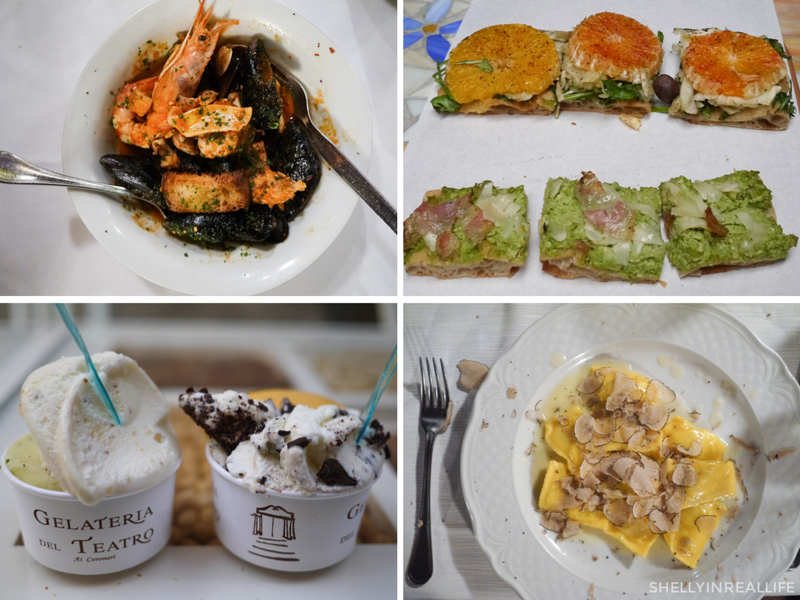 I love all Italian food - pastas, pizzas and gelato - oh my! 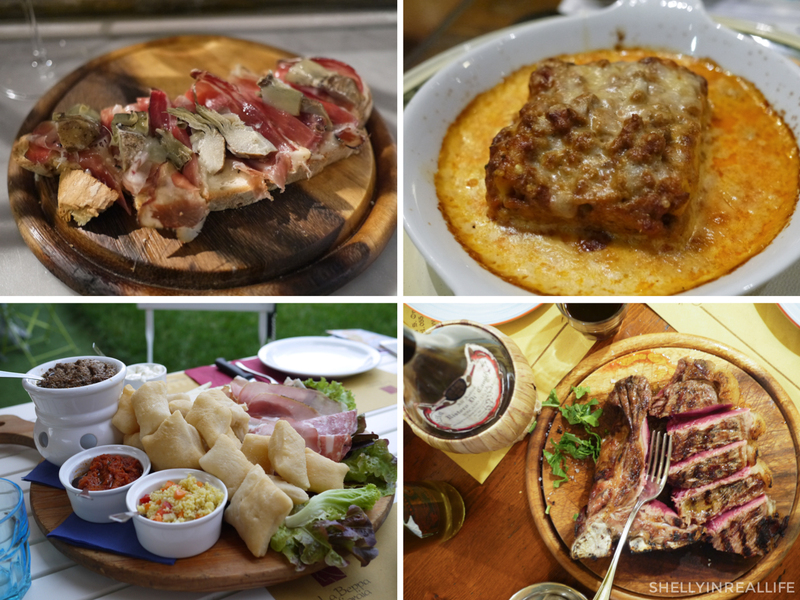 So imagine my pure bliss during the ten days J and I spent eating our way through Italy! 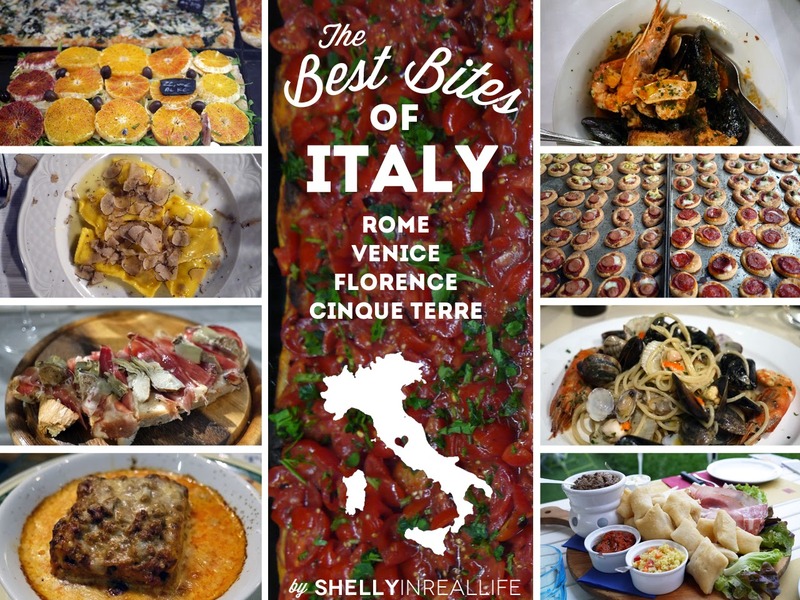 I've been asked what my food recommendations are for these cities, so I've consolidated all of those here in this Best Bites of Italy series. In this edition, we'll be looking at Rome, Venice, Florence and Cinque Terre. I've also include links to each of my blog post elaborating on why each place was so awesome! 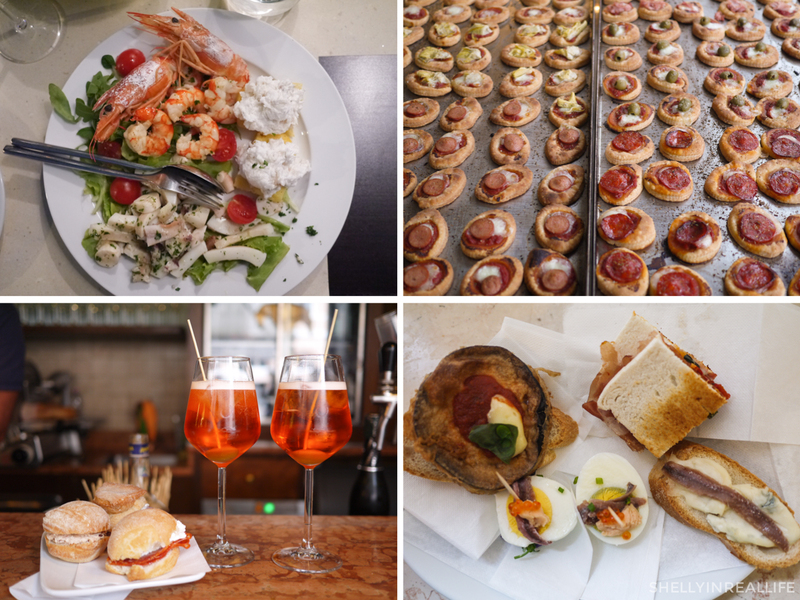 Out of the four cities we went to, Rome was definitely ranked high on good eats. We were surprised since we've always heard that Rome is filled with tourist traps. We got pretty lucky and ate some really memorable bites here. Great city for fresh seafood and pizza! Renato e Luisa: Amazing "Classic" Italian food, this seafood soup is what foodie dreams are made of. 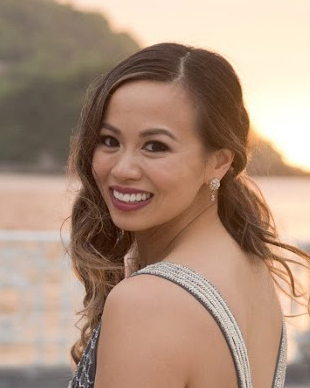 Make a reservation for dinner! Be sure to get some stuffed zucchini blossoms too, another Roman staple. La Pizza del Teatro: A new spin on pizza with innovative toppings on top of delicious flatbread. Gelateria del Teatro: Hands down one of the most popular gelato places in Rome. Right next to La Pizza del Teatro, two birds, one stone! Osteria Le Mani in Pasta: A bit out of the way in Trastevere, but such an effortlessly delicious meal. Fresh Truffles for 14 Euros? What? Giggetto: Fried Artichokes in the Jewish Ghetto is a popular bite, give it a try if you have some time. Forno Campo de' Fiori: Loved the aranchini balls here! Pass on the pizza though. We only stayed in Venice for one night, but had an amazing fresh seafood dinner. Since we got here on a Sunday, a ton of the small tapas restaurants Venice is famous for were closed. We did end up trying some Monday afternoon, but found them average at best. The Campari Spritz drinks on the other hand... always on point! I could drink Spirtz (adult orange soda) for days. Osteria Alla Frasca: Was a confusing 15 minute walk from the Rialto, but was great for a fresh seafood meal. Must order freshly caught seafood in the city on water. Cip Ciap: Tiny pizzettes that are basically pizzas made with puff pastry. Amazing fresh out of the oven! Al Merca: A true hole in the wall that served tons of tiny sandwiches. My favorite was their Crudo, Robiola e Tartufo sandwich, basically ham and truffle cheese. Oh, and their spritz were to die for. All Arco: Another tapas restaurant, had fun little bites to try. I enjoyed the egg with anchovies and caviar. Florence is full of rustic Tuscan food. Think Florentine Steaks and Tuscan Stews. For some reason I thought I could get more seafood here, but that's only wishful thinking. J and I also got tricked into a few tourist traps here: skip Acqua al 2 and L'osteria di Giovanni; the first sucked hard, and the latter was 'meh' despite great reviews. Uscio e Bottega: steps away from the Duomo, this bottega just was the poster child of charming local joint. Loved LOVED their crostonis - came back 2x to have it! La Beppa Fioraia: recommended by my AirBnB hostess, loved the outdoor patio seating. Their cheese plate was unreal, just look at the picture above! Their pastas were "meh", but apparently the pizzas here are amazing. It's served only during dinner so we didn't get to try, but please go try! Trattoria San Lorenzo: I was in love with the lasagna here, but J's gnocchi was pretty good but not great. Might be worth it to try for lunch! All'Antico Ristoro di Cambi: You can't go to Florence without trying a Florentine Steak, we had ours here and found it a great experience. There are 5 cities to enjoy in Cinque Terre. 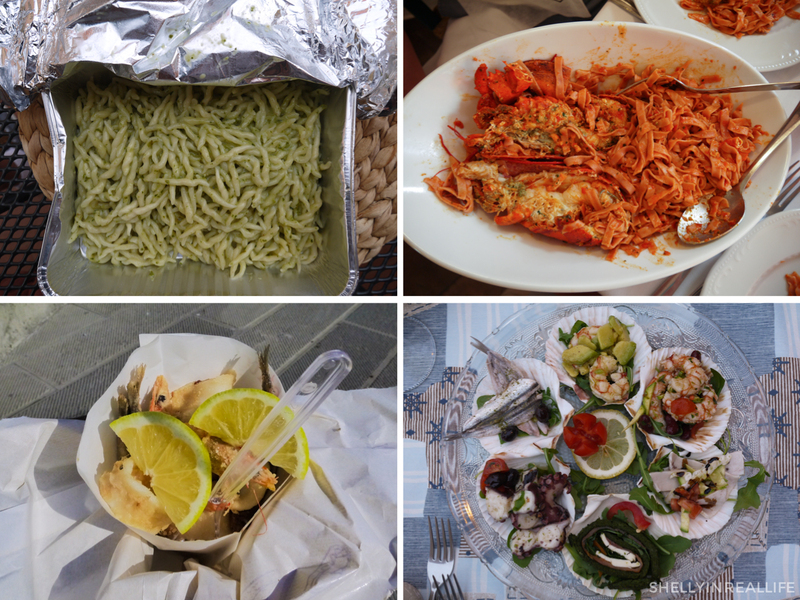 Out of all the cities we went to, we wish we stayed at Cinque Terre longer because we loved the ocean-side vibe, the delicious variety of authentic food and amazing seafood. We found that a lot of the charm was very much intact despite it's touristy nature because Cinque Terre is so secluded from everything else. Not once did we get tricked into a tourist trap without already knowing it was probably going to be a tourist trap. Given my experience in Florence, this was a miracle. Gastronomia San Martino (Monterosso): This place is the king of Italian fast food. Be prepared to pay very little for amazingly fresh homemade pastas. Pesto was invented in Cinque Terre, so we kept getting the Trofie Pesto here - just the best! Trattoria dal Billy (Manarola): We had the best lobster pasta here. Everything about it was great. Highly recommended, and it lives up to it's TripAdvisor's reputation. L'Ancora della Tortuga (Monterosso): Come here for a romantic oceanside seafood dinner. The food was okay, but our cliffside table outweighs any negatives of the food. ??? (Manarola): Right across the street from Gelateria Cinque Terre (which was also pretty good), there was a place with fried mixed seafood in a cone. Fried mixed seafood in Cinque Terre is always a good idea. Am I missing any of your must-haves in Italy? Please share in the comments below - I'm always looking for recommendations for good eats!